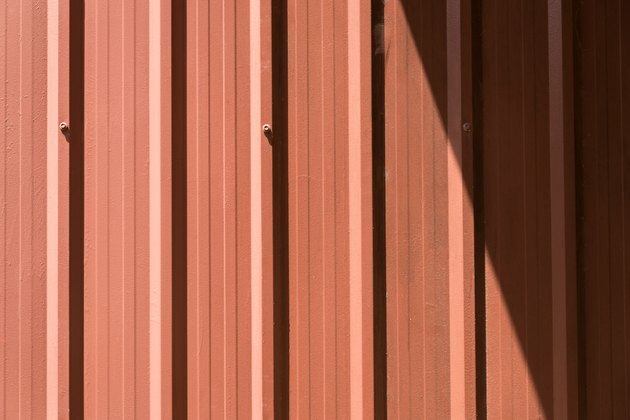 Corrugated metal is lightweight and more affordable than many types of wood—one of the many reasons it makes for ideal fencing material. The list goes on. Unlike wood, corrugated metal does not need to be stained and treated regularly. This means it is maintenance-free fence and will hold up all year. The metal is also weather resistant and easily recyclable. When building a corrugated metal fence there are a few things to keep in mind. First, sink your fence posts to at least 18 inches into the ground, and be sure it's safe to dig in the area of installation. Next, make sure to get HOA and city approval for your privacy fence. You must abide by certain regulations, such as keeping fence height under 8 feet. Once you have the green light to build your fence, choose a style and get going. First and foremost, you'll need corrugated steel panels. The amount of panels will vary on the size of the enclosed area. Other supplies will include furring strips, Tapcon concrete screws, corrugated steel screws, a carbide tipped masonry drill bit and a hammer drill and driver. First, attach the furring strips to a pre-built wall using the Tapcon concrete screws. Pre-drill the holes using a masonry bit that was included in the Tapcon screw kit. Next, line up the steel panels against the walls and make sure they're even across the top. Overlap at least one ridge and drill the steel screws through the panels and furring strips. First, measure the length of your fence that you want to cover. Next, mark it out with a string line to indicate your post holes, so they're kept straight and level. Fit the posts, plumb them up and pour in fast-setting concrete, which dries within 15 minutes. Put a plinth board in across the bottom, making sure it's level before fixing it to the post. Mark out where your rails are going to go and notch it out with a circular saw. Make a box frame to fix your corrugated sheets to. Once you attach the metal to the frame, make however many more panels needed, and secure them to the fence. For a more country classic look, you can add wooden framing to the corrugated metal fencing. For an industrial chic style, install the fencing without wooden frames. Paint the fence in an eye-grabbing color for a modern flair.